Does the thought of canned salmon bring on images of fried salmon patties or salmon salad? The texture and the packaging of canned salmon make it seem fit for little else than the same old/same old recipes that our moms and grandmas created from canned fish. We try to eat more fish and seafood. While we love grilled salmon steaks in our little corner of the world; sometimes the availability (and the price) of fresh salmon leave us with canned salmon on the menu instead. Lately, I've discovered with a little patience--I can create lemony dill seasoned, pan seared salmon from canned salmon. It isn't a perfect copycat of fresh salmon; but, it certainly breaks the monotony of salmon cakes and salmon salad! 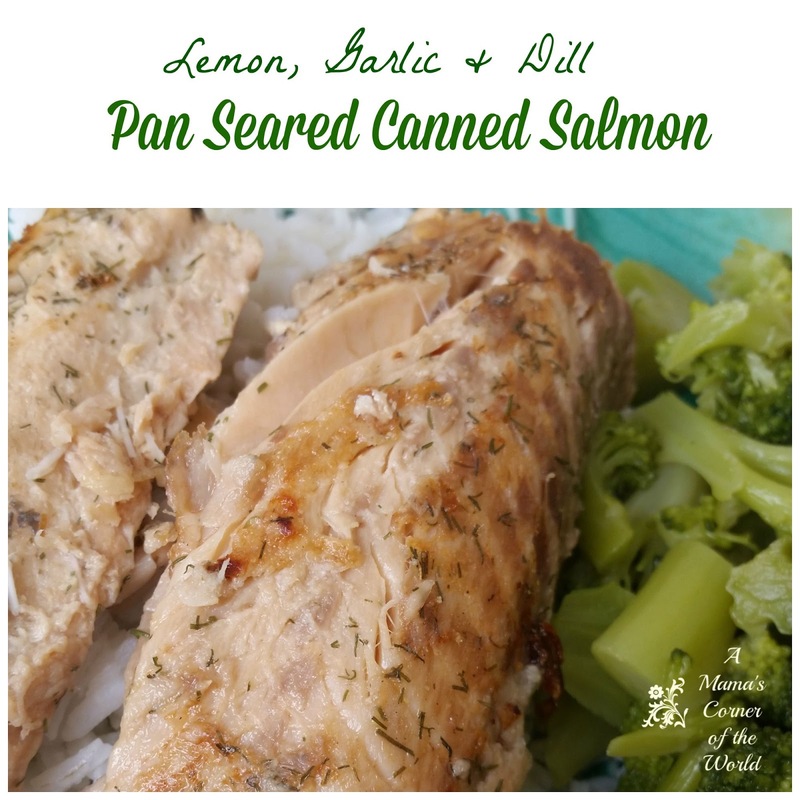 What is my recipe for Lemon Dill Pan Seared Canned Salmon? Prepare the Salmon. **Bumble Bee or Chicken of the Sea brands do require a little de-boning and skin removal--but, they will work if you work slowly! A 15 oz. can of salmon will usually yield about 10 oz. of actual Salmon pieces once the bones and skin are removed and the liquid is drained away. If the price is right for boneless, skinless, canned salmon; it's a little easier to prep for the recipe. Drain the liquid from the salmon and gently separate into large pieces. Most 15 oz cans of salmon will separate into three large sections or four smaller ones. Gently pull off the bones and skin from the salmon pieces. Preheat the Frying Pan. I brush the pan lightly with olive oil or coconut oil and heat until hot. Lightly Sear the Salmon. Gently place the salmon pieces onto the preheated pan. Drizzle with 1 tsp. of Lemon Juices, 1/4 tsp. Garlic Powder 1 tsp. Dill Weed and half of the pepper. Heat over medium heat for about 2-3 minutes. Turn the Salmon carefully, season the second side with the remaining lemon juice, garlic powder, dill weed and pepper. Heat the second side for another 2-3 minutes or until the salmon is heated through. Serve. Gently remove the salmon from the frying pan to a serving plate. 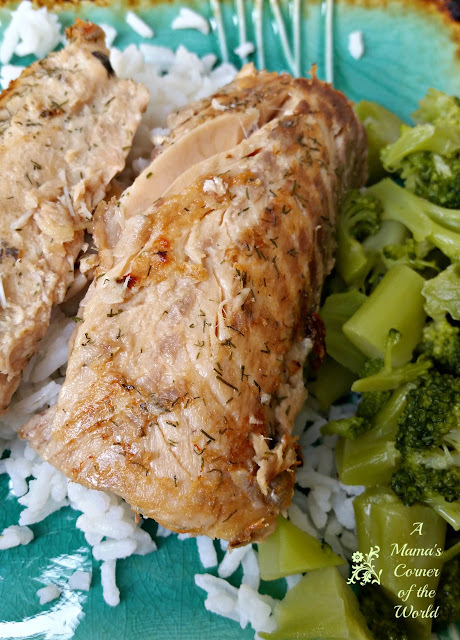 I like to serve this salmon over a bed of brown rice with a side of broccoli and a green salad. *Note: I frequently make this dish ahead of time and store in containers for lunch too! Disclosure: We were not compensated for this post. We may; however, receive slight compensation from affiliate linking within our posts.